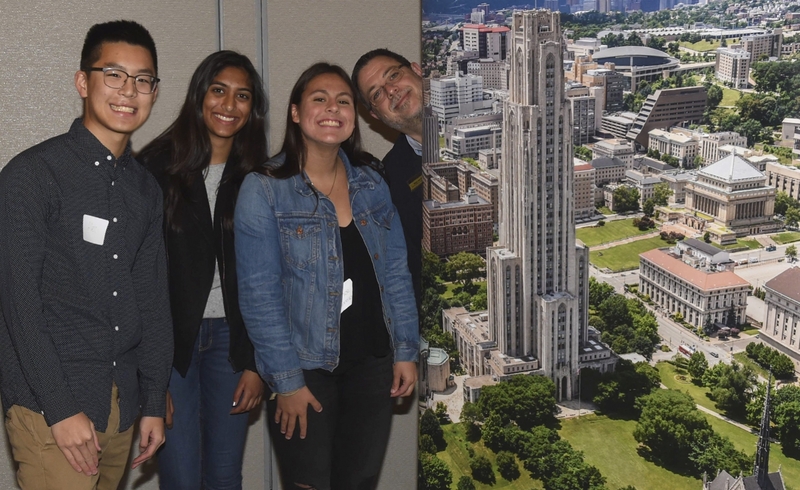 From left: High school students Alexander Tran, Serena Montano and Renee Shahnazarian along with Marc Harding, vice provost for enrollment, gathered next to a banner featuring the University of Pittsburgh Cathedral of Learning at an event for prospective students and their families in San Diego, California. 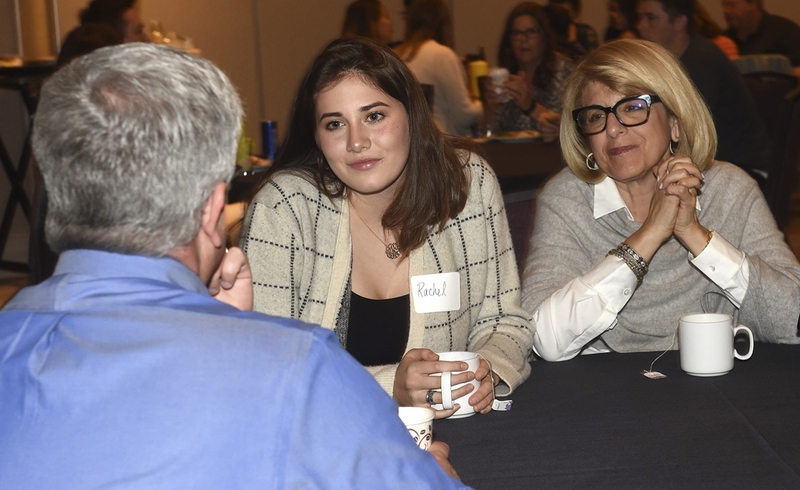 Rachel Roberts, a junior in high school, and her mother, Joanne (right), a Pitt alumna of the Graduate School of Public Health, met with Tom Becker, associate director for regional recruitment, at an event for prospective students and their families in San Diego, California. 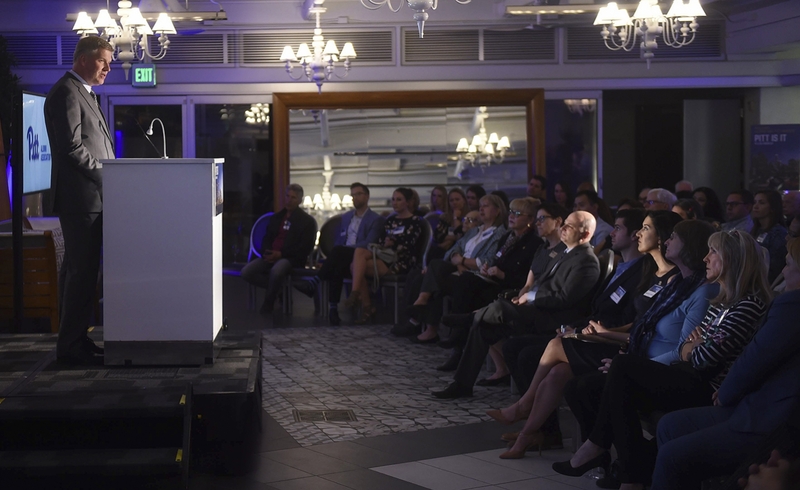 Chancellor Patrick Gallagher addressed more than 100 attendees at an event in Beverly Hills during the Pitt in LA trip. The event was hosted by the Southern California Pitt Club and the Pitt Alumni Association. 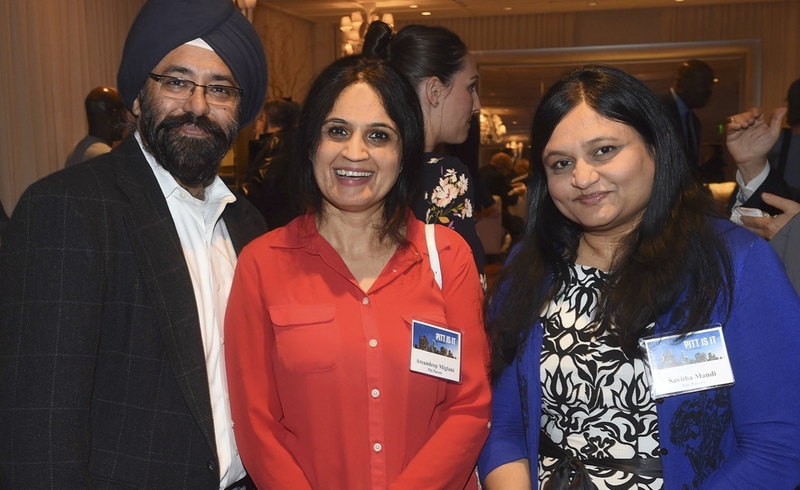 From left to right: Tervinder Miglani with his wife, Amandeep, of Irvine, California, and Savitha Mandi, of Placentia, California, attended an event in Beverly Hills hosted by the Southern California Pitt Club and the Pitt Alumni Association. 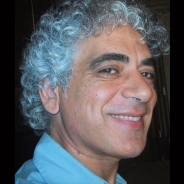 The Miglanis' daughter is in her first year at Pitt, and Mandi's son is a second-year student. 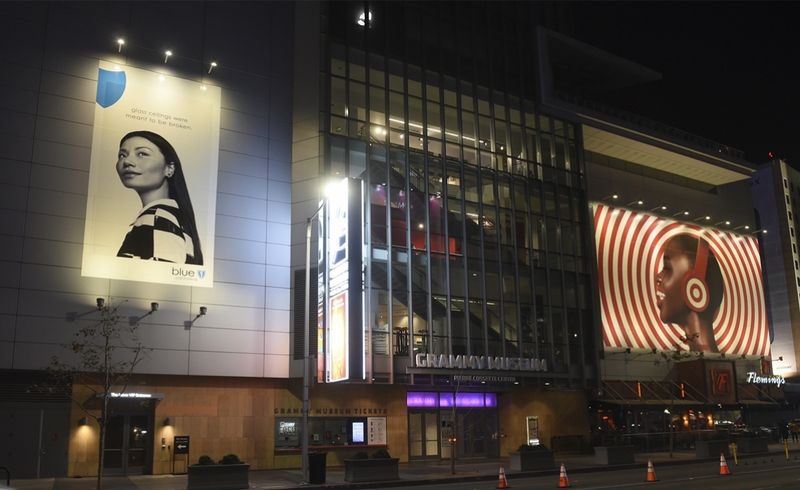 The Pitt Alumni Association hosted a young alumni reception at the Grammy Museum in downtown Los Angeles. 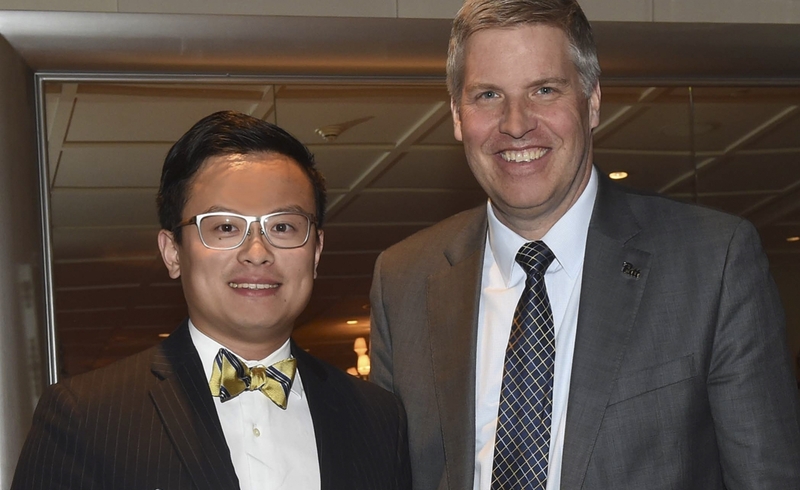 Pitt Chancellor Patrick Gallagher greeted alumni including Samuel Wang (ENGR '13) at a reception in Beverly Hills hosted by the Southern California Pitt Club and the Pitt Alumni Association. 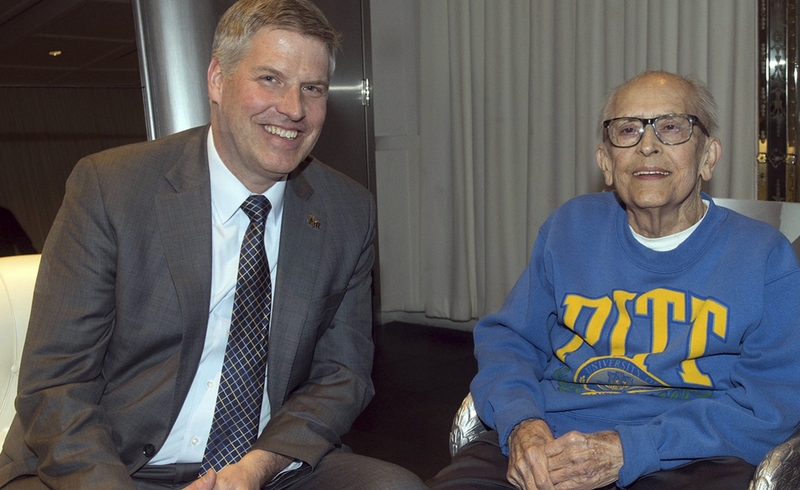 Pitt Chancellor Patrick Gallagher visited with Walt Sumansky, a 1952 Pitt graduate, at a reception in Beverly Hills hosted by the Southern California Pitt Club and the Pitt Alumni Association. Kathy Humphrey (far left in blue), Pitt's senior vice chancellor for engagement, talked to alumni at the Grammy Museum in downtown Los Angeles. The event was hosted by the Pitt Alumni Association. Ali Lowndes was elated. Her alma mater had come to see her. 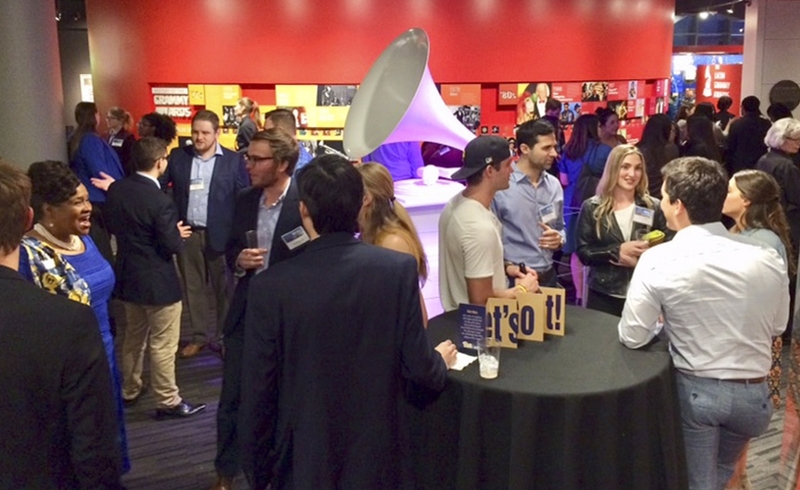 “I love bragging to all of my friends about how incredible my university is that they come all the way out to Los Angeles to spend time with us,” said Lowndes (A&S ’11), who was attending the University of Pittsburgh young alumni event at the Grammy Museum, hosted by the Pitt Alumni Association. “I cherished my time at Pitt so much, and so being able to reconnect with mentors and other alumni out here is amazing,” she said. Lowndes, a former Blue and Gold Society member, was one of many West Coast alumni who renewed connections — or made new ones — when Pitt leaders brought Panther pride to Los Angeles from Jan. 30 to Feb. 1. The visit was the University’s latest endeavor to celebrate accomplishments and strengthen ties with alumni, meet with University supporters and other partners and build awareness across the country of the best public university in the Northeast. The delegation also traveled to Southern California to share Pitt’s story with high school students and their families. Plans are in the works to add a California-based admissions counselor to help bring more students from the Golden State to Pitt. “I’ve only heard great things about Pitt. Ton of opportunities for pre-med students and research opportunities,” Alexander Tran, a high school student and Pitt applicant, said at an admissions event for prospective students in San Diego, another stop on the Pitt tour. “I visited campus in October and I loved it! It has everything,” said Rachel Roberts, a high school student and the daughter of Joanne Roberts, a 1981 alumna of the Graduate School of Public Health. The trip came a year after the University expanded its footprint in the Northeast with a trip to Boston in early 2017, and made a similar visit to North Carolina in October. This time, generations of West Coast alumni were excited to see Pitt’s blue and gold around town. “It was a wonderful excitement this morning, getting to hear an advertisement on KCRW, my local radio station, talking all about the University of Pittsburgh being in town,” said Angela Reno Valvardi (A&S ’09), a former Blue and Gold Society member and president of the Southern California Pitt Club, which connects some of the more than 9,000 Pitt alumni living in California. The class of 2021 is one of the most academically accomplished to ever start at Pitt. The Wall Street Journal named Pitt the top public university in the Northeast for the second year in a row. Pitt out-competed its peers to receive more National Institutes of Health research dollars than peers such as Stanford, Duke and Yale. “It seems like a month does not go by that there is not a new ranking or statistic that highlights our growth and vibrancy,” Gallagher said. Brian Primack, dean of the University Honors College and director of the Center for Research on Media, Technology, and Health, added to the discussion of Pitt’s success, presenting the center’s research studying the effects of social media and mental health. Research in schools and centers throughout the University is setting Pitt apart from peers and building its national reputation, Gallagher said. He added that this reputation is also tied to the rejuvenation of the city of Pittsburgh, with its thriving knowledge-based economy. The city has drawn companies like Google and Uber, and online retail giant Amazon is considering Pittsburgh as one of 20 cities to host its second headquarters, in part due its place among the top most livable cities. “Without question, the University and city you once called home, whether it was last year or 30 years ago, has only gotten better. And that’s due in large part to the caliber of our entire Pitt community,” Gallagher said. The chancellor noted Pitt continues to make an impact on people’s lives through community engagement, which will include centers in Pittsburgh neighborhoods. These locations will be a “one-stop shop” for Pitt to partner with its community and to provide resources for health and wellness programs, job retraining and child care, he said. On Feb. 1, Kathy Humphrey, senior vice chancellor for engagement, energized a crowd of about 100 young alumni at the Grammy Museum in downtown Los Angeles. Many of the students said they remembered Humphrey’s personal touch from her previous role as dean of students and how she made them feel comfortable as new students at Pitt. Now, as graduates, they looked back on that time with fondness as they shared conversations with her in Los Angeles.